KERNSPIRACY is a community building and peer support project for designers and creative professionals. Los Angeles is a tough place to be a designer, and it’s easy to feel like you’re out there all on your own. KERNSPIRACY is intended to address this by creating forums for people to ask for advice, feedback and support from their creative peers. 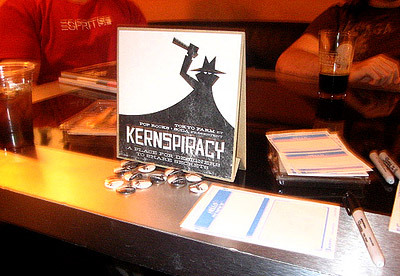 KERNSPIRACY hosts bi-monthly get togethers where designers and other creatives can come out to meet one another and trade ideas and critiques. Autumn is all about change so this time around we’re doing something a little different and screening a very special film. We’re not tellling you what the movie is, but rest assured if you’re a designer you’ve heard of it. As usual, there will also be drinks and conversation along with the occassional spontaneous arm wrestling match.